Tuition fees are calculated according to the length of the private lesson. In addition to the private classes, the tuition includes weekly group classes, parent training classes, monthly solo recitals, group concerts, and various other opportunities. Students may attend as many of these extra classes and events as they wish without any additional fee. Observing others’ lessons and classes is, in fact, encouraged. However, there is no refund or adjustment for missing regularly scheduled classes or choosing not to participate in group lessons. Please keep in mind that these fees are for the full academic year, which includes 30 private lessons. These tuition rates are for the entire 2018/2019 school year. This is the total due for the entire year. Students have the option to enroll for 30’, 45’, or 60’ lessons. The student’s age and attention span should determine the length of lesson. If the student only has a 5’ or 10’ attention span, we will use the remainder of the lesson to instruct the parent. These classes are outside of our regular curriculum and may be taken independently or in addition to our regular enrollment. Students must audition in order to register for chamber music. 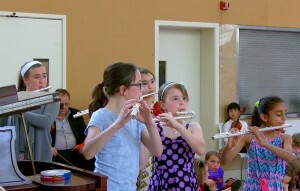 If students are selected to perform in a chamber music group, they will then be placed with peers according to playing level and scheduling availability. The tuition covers all performances and weekly classes. Students should be able to read music and play in at least late Book 2 and up. Students age 0-3. No Fees incurred for students under 6 months; tuition will be prorated. Tuition can be paid by credit or debit card only. You must choose how you would like to schedule your tuition payments for the entire 2018/2019 school year when you register. You can choose to pay for the year in 10 monthly payments (Sept.-June) or in two installments (Sept. and Jan.) You will get an email that states what your monthly payments will be and then the payments will be scheduled. A deposit of $300 is required at the time of registration in order to hold your lesson slot. This deposit is put towards your total tuition bill. Students must enroll for the full year. However if within the first three weeks of either the Fall or Spring term a family decides to withdraw from G.S.A., they may receive a tuition refund on a pro-rata basis. After the third week of the term, there can be no tuition refunds for the remainder of the semester. For any regularly scheduled lesson canceled due to weather, teacher absence, or emergency G.S.A. closing, a makeup session will be given. However, there is no refund, adjustment, or makeups for students missing regularly scheduled classes or lessons for any reason. These times are reserved upon registration, and failure to appear at the scheduled times deems the lessons or classes forfeit. For new students beginning mid-semester, tuition will be prorated to reflect the adjusted start date. We do not offer any discounts at this time, but we do have some limited need based scholarship available through the Friends of Greenwich Suzuki. If you wish to learn more, or if you wish to consider sponsoring a child please contact the director and we would be happy to discuss this with you.